Scoil San Treasa is a national primary school in Mount Merrion in south County Dublin. We created a mobile responsive website design for them. The website has become an integral part of the school’s communications & is regularly updated to feature activities, events & achievements at the school. The school calendar, book lists & photo galleries are very popular. A number of the teachers at the school received training on the website and they keep the site up to date. 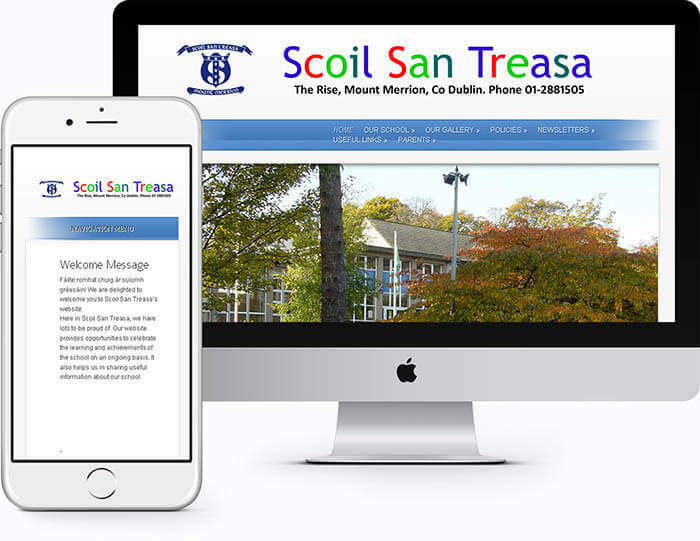 "A special word of thanks to the internet marketing business Hoot.ie for their high level of assistance in designing our new website - we appreciate the time and expertise that Hoot.ie have shared with Scoil San Treasa. Mile buiochas!Le gach dea-ghuí"